In 1863, 19-year-old engineer Gilbert Elliott contracted with the Confederate Navy Department to construct an ironclad gunboat designed by John L. Porter, the navy’s chief architect. 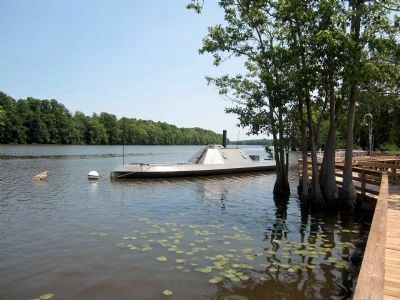 Elliott built the vessel at Edwards Ferry on the Roanoke River, 60 miles upstream from here, where his “shipyard” was Peter E. Smith’s cornfield. 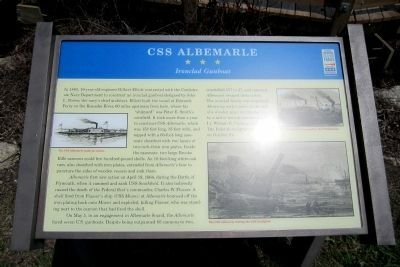 It took more than a year to construct CSS Albemarle, which was 158 feet long, 35 feet wide, and topped with a 60-foot-long case-mate sheathed with two layers of two-inch-thick iron plates. Inside the casemate, two large Brooke Rifle cannons could fire hundred-pound shells. An 18-foot-long white-oak ram, also sheathed with iron plates, extended from Albemarle’s bow to puncture the sides of wooden vessels and sink them. who was standing next to the cannon that had fired the shell. 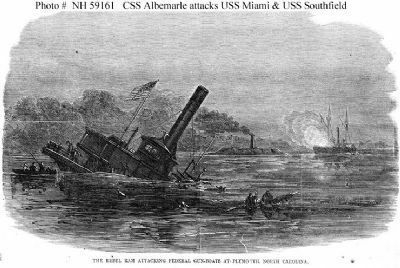 On May 5, in an engagement in Albemarle Sound, the Albemarle faced seven U.S. gunboats. Despite being outgunned 60 cannons to two, outshelled 557 to 27, and rammed, Albemarle escaped destruction. The ironclad finally was torpedoed (blown up with a mine on the end of a wooden spar) on October 27, by a motor launch commanded by Lt. William B. Cushing, and sank. The Federals recaptured Plymouth on October 31. Location. 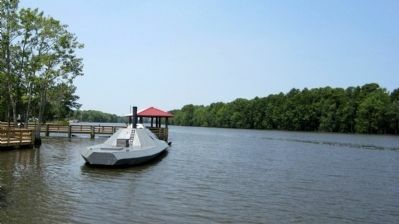 35° 52.14′ N, 76° 44.895′ W. Marker is in Plymouth, North Carolina, in Washington County. Marker can be reached from the intersection of East Water Street and Madison Street, on the left when traveling east. Touch for map. 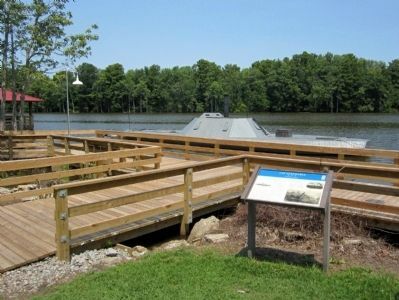 Located behind the Port O’ Plymouth Roanoke River Museum. Marker is at or near this postal address: 302 E Water St, Plymouth NC 27962, United States of America. Touch for directions. this marker); Rt. Rev. Alfred Augustin Watson (about 400 feet away, measured in a direct line); Cushing’s Torpedo (about 500 feet away); Latham House (about 700 feet away); Washington County Courthouse (approx. 0.2 miles away). Touch for a list and map of all markers in Plymouth. More about this marker. On the left is a sketch of "The CSS Albemarle ready for action." 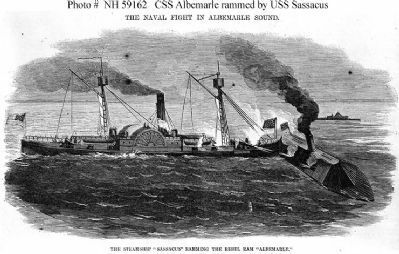 On the right are images of the "The CSS Albemarle rammed by the USS Sassacus" and "The CSS Albemarle sinking the USS Southfield." 6. "The Steamship 'Sassacus' Ramming The Rebel Ram 'Albemarle'"
7. "The Rebel Ram Attacking Federal Gun-Boats at Plymouth, North Carolina"
Credits. This page was last revised on June 16, 2016. This page originally submitted on July 1, 2012, by Bernard Fisher of Mechanicsville, Virginia. This page has been viewed 663 times since then and 15 times this year. Photos: 1, 2, 3, 4, 5, 6, 7. submitted on July 1, 2012, by Bernard Fisher of Mechanicsville, Virginia.